ing a button or swi t ch vi a RF remote control. proach used to implement the automation. supplies the power to the converter circuit and the DC Motor. which is then fed into the control circuit. 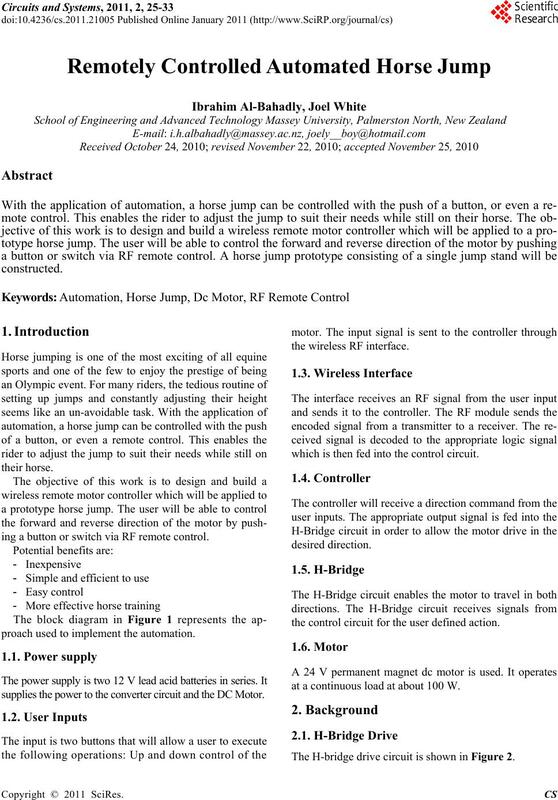 the control circuit for the user defined action. 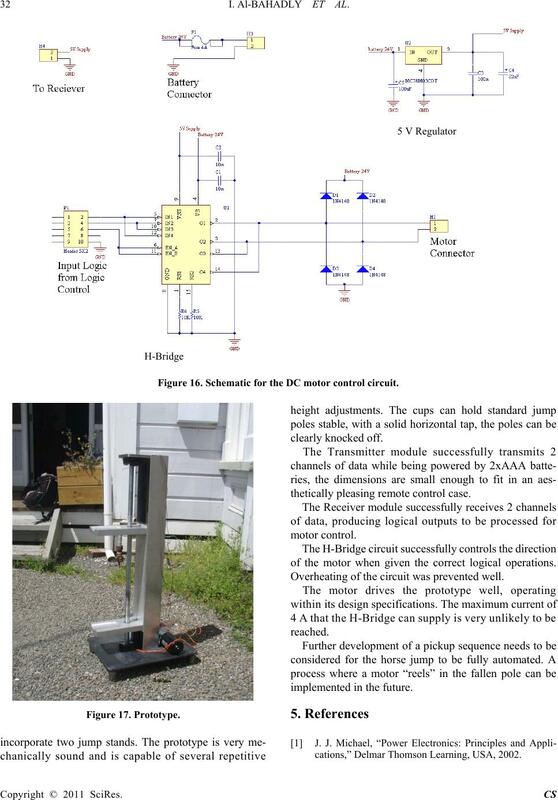 at a continuous load at about 100 W.
The H-bridge drive circuit is shown in Figure 2. Table 1. The operations of the dc motor. lost resulting in much more effective horse training. Figure 3. 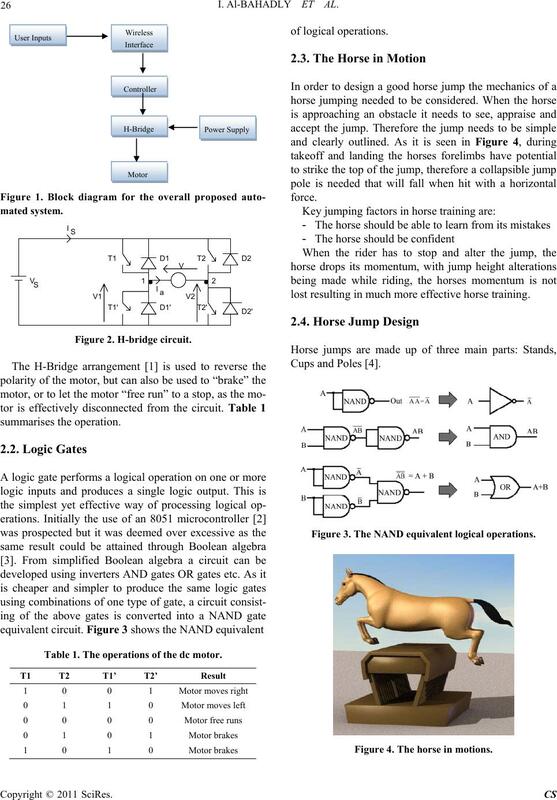 The NAND equivalent logical operations. Figure 4. The horse in motions. Figure 5. Example of a stand. 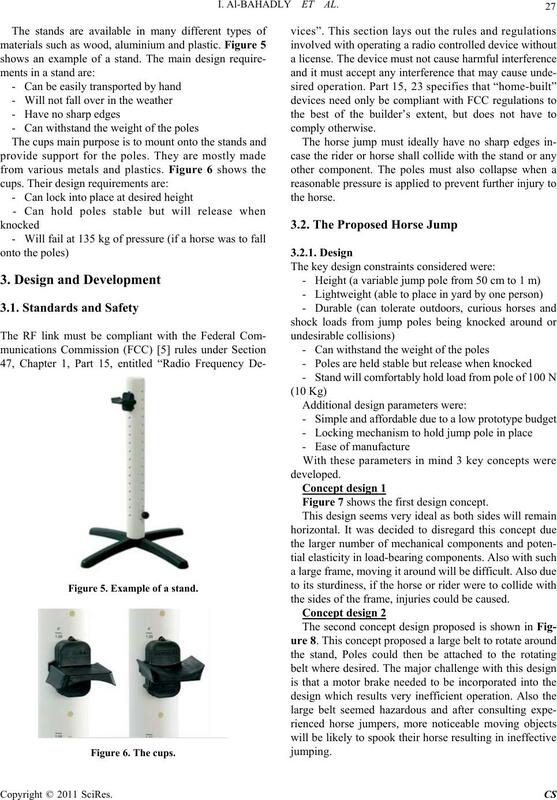 Figure 7 shows the first design concept. the sides of the frame, injuries could be caused. Figure 7. Design concept 1. Figure 8. Design concept 2. 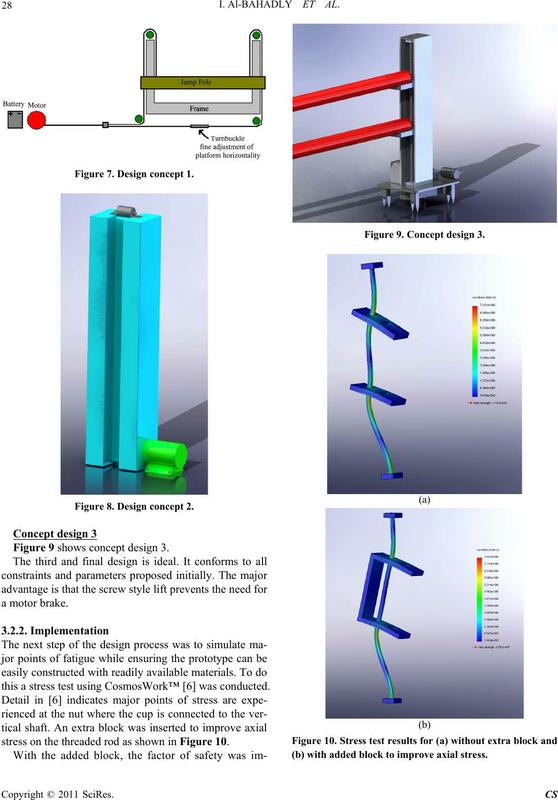 Figure 9 shows concept design 3.
this a stress test using CosmosWork™  was conducted. stress on the threaded rod as shown in Figure 10. Figure 9. Concept design 3. (b) with added block to improve axial stress. highest attainable factor of safety was sought after. to be considered [see Figure 11]. motor was calculated as 40 W.
then tested in the lab for its characteristics. be able to satisfy 4 A load at 24 VDC. Figure 11. Gearing arrangement for the motor. was developed in Altium Designer™ . 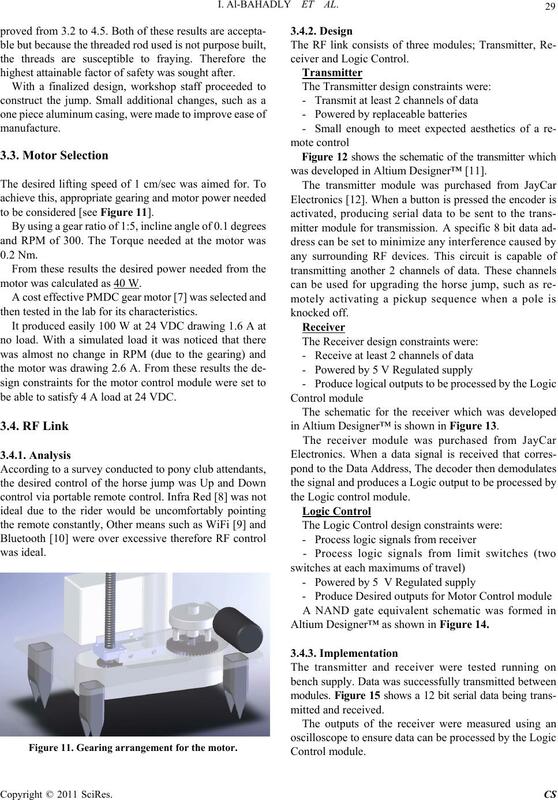 in Altium Designer™ is shown in Figure 13. 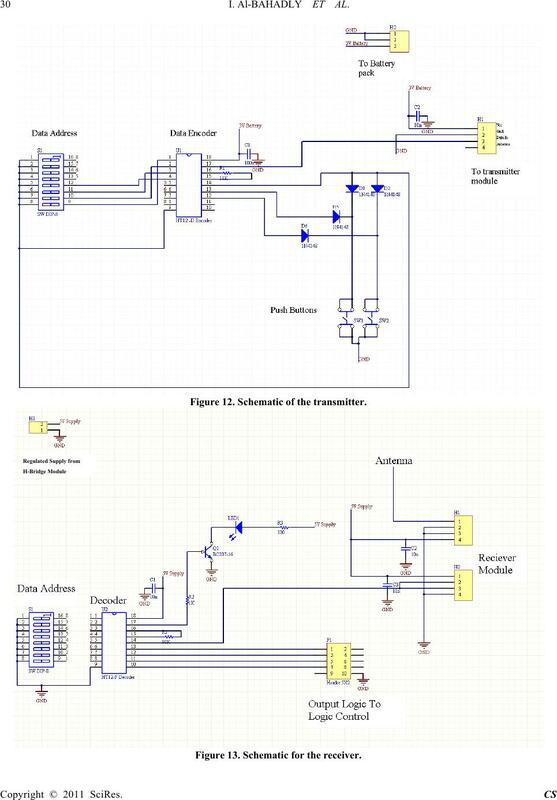 Altium Designer™ as shown in Figure 14. 30 I. Al-BAHADLY ET AL. Figure 12. Schematic of the transmitter. Figure 13. Schematic for the receiver. Figure 14. NAND gate equivalent schematic. Figure 15. 12 bit serial data tr ansmitted and received. Designer™ and assessed for reliability. due to the High amperage passing through. them with the prototype as shown in Figure 17. 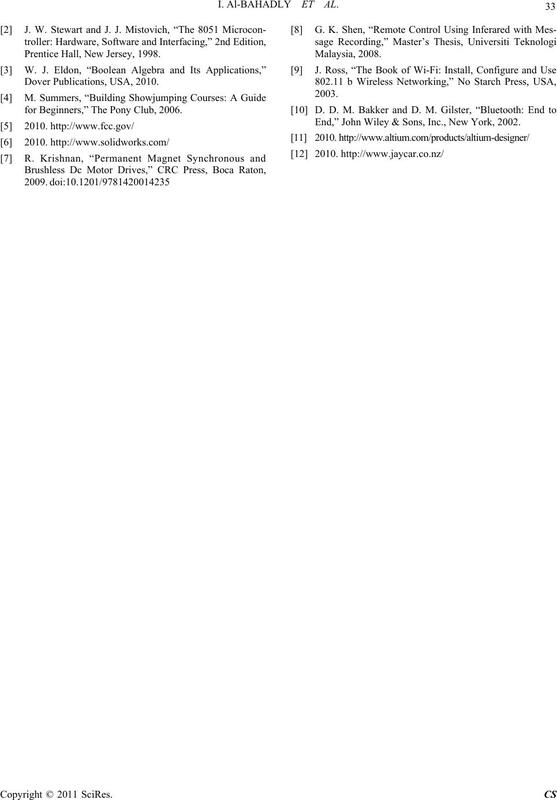 32 I. Al-BAHADLY ET AL. Figure 16. 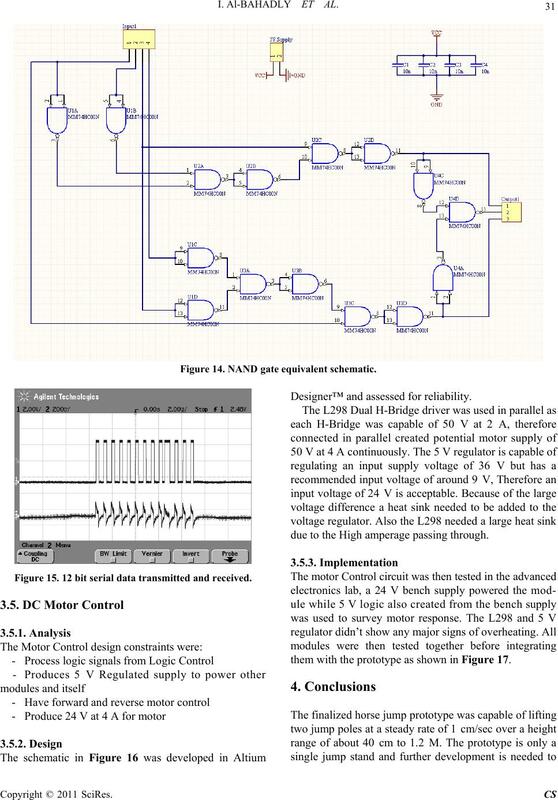 Schematic for the DC motor control circuit. thetically pleasing remote control case. of the motor when given the correct logical operations. Overheating of the circuit was prevented well. implemented in the fu ture. cations,” Delmar Thomson Learning, USA, 2002. Prentice Hall, New Jersey, 1998.
for Beginners,” The Pony Club, 2006. End,” John Wiley & Sons, Inc., New York, 2002.